Mmmmm, eat a peach day. I’ve been “practicing” for this day, almost daily, for the last couple of weeks. Nothing fancy, usually, just cutting into their golden-rosy flesh to have slices straight off the pit in the morning. The best peach I’ve had in the last few weeks was a huge fuzzy fuzzy softball sized specimen I picked up at the Metchosin Farmer’s Market. We took it to the beach, and had it for a snack in the 33C degree heat. The combination of the super sweet juice and the salt on my hands from the ocean was divine. It brought me back to when I used to live in St. Lucia, and we’d bring ripe mangos down to the beach and eat them while sitting in the water at the edge of the surf. Like Thai cooks know, the salty and the sweet in harmony elevate the fruit to an entirely different level. Also eating them in the ocean allows you to get totally messy with impunity! The peach tree (Prunus persica) is a species of Prunus native to China that bears an edible juicy fruit called a peach. The scientific name persica, along with the word “peach” itself and its cognates in many European languages, derives from an early European belief that peaches were native to Persia. The modern botanical consensus is that they originate in China, and were introduced to Persia and the Mediterranean region along the Silk Road before Christian times. 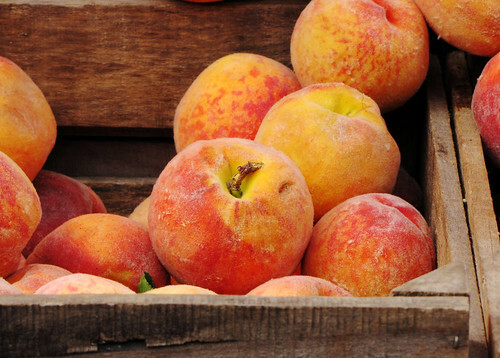 Though fuzzy peaches and nectarines are regarded commercially as different fruits, with nectarines often erroneously believed to be a crossbreed between peaches and plums, or a “peach with a plum skin”, they belong to the same species as peaches. Several genetic studies have concluded in fact that nectarines are created due to a recessive gene, whereas a fuzzy peach skin is dominant. In China, the peach was said to be consumed by the immortals due to its mystic virtue of conferring longevity on all who ate them. The divinity Yu Huang, also called the Jade Emperor, and his mother Xi Wangmu, also known as Queen Mother of the West, ensured the gods’ everlasting existence by feeding them the peaches of immortality. The immortals residing in the palace of Xi Wangmu were said to celebrate an extravagant banquet called the Pantao Hui or “The Feast of Peaches”. The immortals waited six thousand years before gathering for this magnificent feast; the peach tree put forth leaves once every thousand years and it required another three thousand years for the fruit to ripen. My plan for National Eat a Peach Day was to bake a cobbler. But much to my surprise, I’ve been stymied by the fact my local grocery store only had unripe peaches!! (yes, Thrifty Foods, I’m looking at you.) It’s the middle of August, I was not expecting that. So I bought a bag of unripe peaches, and have placed them on my counter in a paper bag, and I’m hoping they take take that last critical critical step in their life cycle really soon. My plan for this cobbler is to go light on the sugar, and have this around the house more as a breakfast food, than as a desert. Basically it’s stewed fruit and a little bit of bread, no? In a large bowl, combine sugar, flour, lemon zest and juice and cardamom. Toss fruit with sugar mixture until well coated. Transfer fruit mixture to 8×8-inch baking dish. To prepare the topping, combine flour, sugar, baking powder, baking soda and salt in a large bowl. Cut butter into flour mixture until mixture is crumbly. Add buttermilk and stir with fork until dough comes together. Form a ball and transfer to a lightly floured surface. Knead dough until smooth. Pat dough into a large oval, roughly 1/2-inch thick. Cut out rounds of dough using 3-inch circular cookie cutter. Repeat with scraps until all dough has been used. Arrange rounds over fruit mixture. Brush dough lightly with milk and sprinkle demerara sugar on top. Bake 40-45 minutes. Serve with cream. Let me put in a little plug here for EAT Magazine. If you’re in BC, and particularly Victoria or Vancouver, I would recommend you pick up this little (free!) magazine when you find it at your local cheese shop or wine store. While I’m a little suspicious of the restaurant reviews as they are unfailingly positive, it’s packed full of good information about what is seasonal, what foodie events are on, and always has a few good recipes to try. You can also read each issue online, though, I find this isn’t as satisfying as decamping to your favorite coffee shop with the latest copy. ps – will post a picture of the finished product in a couple of days when the peaches have finally ripened. Thank-you for your nice words about EAT magazine. It is always appreciated. Just to set the record straight – EAT does not do restaurant “reviews” per se. We leave those to others. We consider our articles informational reports and are not meant as critiques. If we try a restaurant and cannot recommend it – we do not publish the report.